Our latest project management integration is now live: Lighthouse, by entp! Setting up your Lighthouse integration is very simple! Head over to your integrations page, and enter your API key and your Lighthouse URL. For example, if your Lighthouse URL was http://doorbell-io.lighthouseapp.com, you would just enter doorbell-io in the textbox. 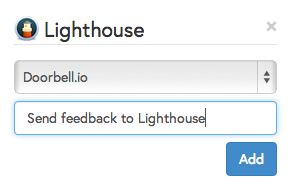 Once that’s done, you can start creating tickets with your user feedback in the Lighthouse projects! The description is already prepopulated for you with the original message from the user. Nicely formatted in markdown of course!